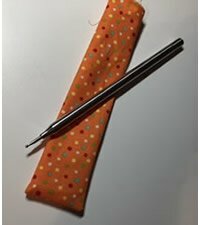 Use this unique all metal tool as the perfect point turner for home dec and general sewing applications. The generous round ball located at the end prevents the tool from “poking” through the seam. This “round ball tip” makes a great seam press when turning the item inside out. Simply, run the tool along the seam while giving a good press - no more having to pull the seam out with a pin! Another great application is to use the tool as a “fabric safe” stiletto - place behind the presser foot to “gather” fabrics, use to smooth out bias tape or any other fabric/trim you are sewing to keep your fingers safe from the needle!